Investing in land in Dubai is emerging to be a safe bet. The scarcity of land parcels in the city is pushing up prices. In the first six months of 2017, land prices in the city’s freehold zones recorded a 13 per cent gain, according to data from Reidin-GCP. In comparison, properties in Dubai witnessed an annual price decline of 1.2 per cent in Q2 of 2017, says consulting firm ValuStrat. Through the last 14 years, land investments in Dubai have out-performed residential units by more than 50 per cent, even after taking into account returns from rental income, says the Reidin-GCP report. “Plots in established locations such as Downtown, the Marina, Deira, Bur Dubai and Sheikh Zayed Road can be increasingly difficult to source as these districts become built out. Newer locations to the south and west of the city generally offer more availability, with open tracks of land being progressively opened up with installation of services and utilities,” says Declan King, managing director and group head real estate, ValuStrat. For the uninitiated, there are four types of land ownership in the UAE – GCC land, available freehold for UAE nationals only; GCC land for lease, which is open to all nationalities and can range in duration from one year to 99 years; freehold land for all nationalities; and freezone land for lease, which is open to all nationalities and can range in duration from one to 99 years and is renewable. 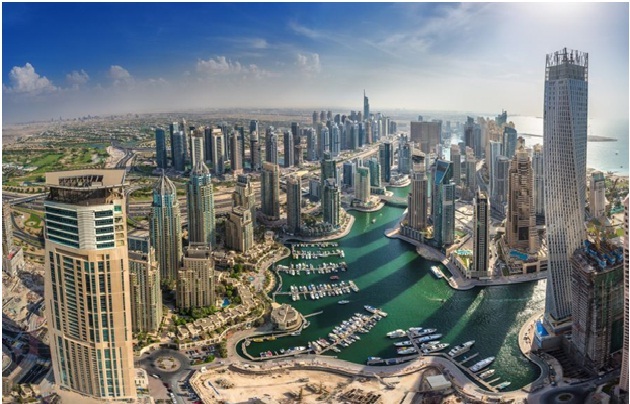 Expats can buy land in many areas of Dubai – generally the main foreign ownership districts. Foreigners wanting to buy land in Dubai and build their own home have done so in areas such as Emirates Hills, Al Furjan and the Palm Jumeirah. In Abu Dhabi, non-GCC nationals are generally restricted to a 99 year interest in land. It is mostly developers and owner occupiers (in the case of villa and/or commercial plots) who buy land plots in the UAE. In other emirates that are classified as freehold, expats can buy as well (for example, Marjan Island in Ras Al Khaimah, Tilal City in Sharjah, Reem Island in Abu Dhabi, etc). “Land ready for development is scarce and with each new project, supply continues to decline. Primarily, there are two reasons behind it. The master developers after the world economic crash controlled the supply of land to better manage oversupply. This was a move much required for the industry and has resulted in a more sustained growth of asset value. However, a large number of investors who bought land during the boom are still holding on to the plots, risking an oversupply situation,” says Rizwan Sajan, founder and chairman, Danube Group. From January 2015 to December 2016, Dubai land prices tumbled 27 per cent, according to Reidin-GCP. While land transactions in Dubai have been steadily rising since 2016, prices have begun to appreciate only since the start of this year. Dubai issued 38 per cent more construction permits in 2016 versus 2015, data shows. This pace of construction activity will continue to accelerate as the deadline for Expo 2020 approaches, pushing land prices higher. Land prices account for a big chunk of property development costs. When compared internationally, land prices in Dubai are competitive relative to tier cities in Europe and America. “There has, however, been a concern among some analysts and developers that prices are not competitive enough to spark the boom in affordable housing and the government needs to provide additional incentives to developers. These concerns for the most part appear misplaced,” says Hussain Alladin, head of research at GCP Group. In a rising market, some developers will try build a land bank – in the hope they own enough land to cater to their future build requirements and protect against price rises in the years to come. “While there are land opportunities available at decent price points, they remain scarce and few. Since land supply is limited and controlled in the primary market, the inflation is largely in the secondary market. Majority of the land available in the secondary market was bought during the peak, those price points will take years to recover in order to break even, leave aside bringing a handsome profit. More prudent plot owners get into joint ventures with reputed developers, exchanging their plot with ready or off-plan inventory, thereby securing a better return,” suggests Danube’s Sajan. For investors not having the means to acquire plots directly, they can invest in listed developers with extensive land holdings on their books. “As land prices continue to rise, the balance sheet of these companies will expand, effecting their stock price. Investors wanting to capitalise on land prices would do well by currently using proxy means through the capital markets of real estate companies that have a large land bank,” adds the Reidin-GCP report. The title registration charge remains at four per cent for any property one buys, including land. In case the infrastructure is developed in the area, an undeveloped plot service fee is levied on the land owners after a certain period from date of plot purchase.